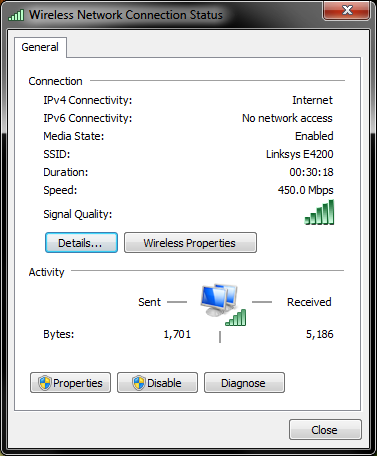 As you may have read last time, I had taken on the task of upgrading the wireless card in my Vaio to take advantage of the new 3 stream 450mbps wireless N routers coming out. The second part of this task was to actually get one of these routers, and get everything running smoothly at the new link speed. The router I decided to go for is the Linksys E4200. It's very small and unoffensive, with no glaring LEDs flashing on the front as is the case with so many routers these days. Apparently, blinding blue LEDs are cool. No, instead the activity lights on the E4200 are hidden on the back as part of the ethernet ports. They don't emit much light at all, but you can even turn those off if you like. Setup was really quite easy. I never bother with the installation CDs and I just jumped straight into the web interface. I was surprised to be confronted with a page that looked as though it wanted to force me to install the Cisco Connect software, but there was an option to bypass that. Something along the lines of, "Continue with an unsecured network". I guess they are trying to frighten ordinary folk into installing their (presumably dummy proof) software. Once I had set up most of the stuff using the supplied CAT5e cable (which was nice since it saved me some rummaging), I enabled the wireless and connected. The moment of truth aaaand.... It connected at 300mbps. All kind of things were going through my head at this point. Was the antenna supplied (as a free gift) with the wireless card compatible with 5GHz? Had the antenna broken once I put the laptop back together? Did it simply become disconnected from the wireless card? Are my router settings wrong? Do I need to do a fresh install of the drivers? It was frustrating stuff, and worrying thinking of what I might have to do to put it right (ie installing a new antenna - again). I reviewed all my settings. I know from researching a bit before hand that the 450mbps link rate is only available on the 5GHz band at 40MHz width, so I set the 5GHz radio to enabled at 40MHz width, disabled 2.4GHz entirely and set the network mode to N only. Still no joy. So I pulled up the wireless connection info to see if while I was messing with the settings, if I could find the right combination to get the 450mbps link rate. 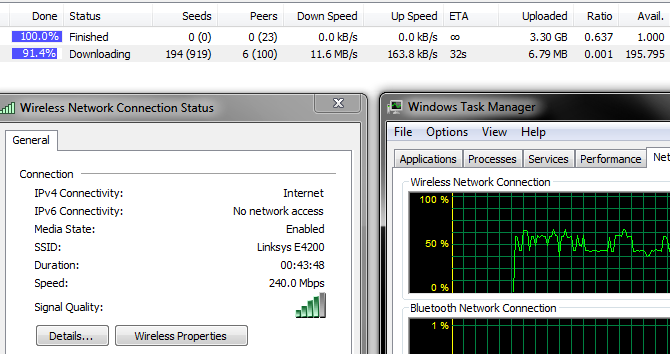 I didn't manage it, but as the router was saving its settings, I noticed the link rate jump up from 300mbps to 450mbps. That was a big relief. At least now I knew the wireless card was working right and was able to pick up the 450mbps signal. I googled around a bit and found some suggestions saying that I need to go into the properties for my wireless adapter and set the channel width to auto, otherwise it will force 20MHz, which I had done previously. There isn't much worth changing in the wireless adapter driver, but I recall a feature called WMM being enabled in the router, but in the wireless driver it was set to disabled. I don't see what correlation this has to the link speed (since it's just software QoS), but I set it to enabled in the wireless driver and the link speed jumped up to 450mbps. The upgrade was a success. Can you believe it? I can't. Of course wireless is subject to things called walls and distance, so I unfortunately don't get the 450mbps speed at the other side of the house. That said, I still get 240-270mbps of rated speed, which is a huge improvement over the embarrasing 108mbps the so called "Super Hub" that Virgin supply. While I haven't done any proper bandwith testing yet, I do know that I can get my full 100mbps download speed, which was my main motive for performing the upgrade. The Virgin "Super Hub" on the left, and the Linksys E4200 on the right. Same location, same wireless card. This was of course, an expensive upgrade overall (£130 for the router and another £30 for the 3 stream wireless card), but for me tinkering with stuff like this is as much a hobby as it was something that needed to be done. I had intended to upgrade my network for some time now and never got round to it. Soon I will buy another E4200, flash DD-WRT on it and replace my old WRT54GL to be used as a wireless bridge, so that then my Xbox 360 and PS3 can also have a taste of 100mbps. I might actually bother downloading demos then.